Typical eating disorder symptoms disrupt normal digestive patterns and may cause mild to severe GI distress. Eating disorder symptoms can include severe chronic restriction, chaotic and unpredictable eating patterns (eg, restriction during the day with bingeing at night), self-induced purging, and laxative abuse as well as excessive intake of caffeinated or carbonated beverages and artificial sweeteners via low-calorie foods, beverages, or gum. University of Sydney researchers evaluated GI-symptom response to a dietary challenge of fructose and sorbitol in individuals with an eating disorder and healthy controls. More than 58% of eating disorder patients exhibited GI consequences due to the sorbitol-fructose challenge, compared with only one (5%) of the healthy controls. Symptom development was more common in those with anorexia nervosa.7 The impact of these findings may be significant to the treatment of individuals with an eating disorder who often drink sugar-free diet products, which can be rich in sorbitol, or rely on fruits as lower-calorie food choices that contain excess fructose, such as apples, pears, and mangos. Sorbitol is found in sugar-free gum and mints; stone fruits, including peaches, nectarines, and plums; apples; pears; and even honey. The RD’s role is paramount in bridging the gap between GI-symptom control and eating disorder nutrition therapy. Identifying and modifying dietary triggers should be initiated when the eating disorder is stable and the eating disorder health care team feels that adjusting the diet won’t exacerbate the eating disorder. Below are screening and assessment questions dietitians should review with patients to identify the underlying cause of the GI problem. • Step 1: Review family and personal history of GI concerns. Clarify whether the patient’s symptoms existed before or after the start of his or her eating disorder. • Step 3: Screen for eating disorder behaviors such as patterns of food restriction, bingeing, purging, and laxative/diuretic use; fluid patterns, including coffee, tea, diet soda, carbonated water, and excessive intake of artificial sweeteners; erratic patterns of meal timing and macronutrient balance; excessive gum chewing; and excessive fiber consumption, particularly through diet foods with isolated fiber additives such as chicory root (inulin), which can contribute to gas and bloating. When treating eating disorder symptoms and GI concerns simultaneously, RDs must provide clients and patients with education, resources, and continuous coaching on the importance of eating consistent and balanced meals and snacks to decrease GI symptoms. Following a structured eating plan will allow them to train their gut, which will lead to symptom reduction. To prevent triggering eating disorder behavior, RDs shouldn’t recommend strict elimination diets in this population, because they can exacerbate restrictive eating patterns. Dietitians who specialize in digestive health can provide general guidelines to modify intake of common dietary triggers, including sorbitol and excess fructose or lactose sources, or adjust fiber intake and fluids as needed to alleviate constipation as they work closely with an eating disorder therapist or eating disorder dietitian. Adding adjunctive therapies such as gut-directed hypnosis, yoga, probiotics, or digestive enzymes also can ease GI distress. 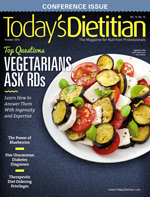 Dietary strategies such as a low-FODMAP (Fermentable oligo-, di-, and monosaccharides and polyols) diet for the IBS patient may be helpful but should be used only when the eating disorder is stable and the eating disorder dietitian and therapist feel the patient is ready to be placed on this type of diet. The role of the eating disorder dietitian is complex, as it requires knowledge of medical nutrition therapy for the eating disorder and comorbid medical and mental health diagnoses as well as psychological awareness and counseling skills. Given the frequency at which eating disorder patients experience GI disturbances, it’s imperative that RDs continue to develop the skills to effectively treat both simultaneously. Through the use of a multidisciplinary health care team as well as consistent follow-up and communication with patients, it’s possible to reduce GI symptoms while effectively supporting patients in their recovery from their eating disorder. — Kate Scarlata, RDN, LDN, is a Boston-based dietitian in private practice and the coauthor of 21-Day Tummy, a New York Times bestseller. — Marci E. Anderson, CEDRD, LDN, cPT, specializes in treating eating disorders and owns a private group nutrition counseling practice in Cambridge, Massachusetts. 1. Hudson JI, Hiripi E, Pope HG Jr, Kessler RC. The prevalence and correlates of eating disorders in the National Comorbidity Survey Replication. Biol Psychiatry. 2007;61(3);348-358. 2. Boyd C, Abraham S, Kellow J. Psychological features are important predictors of functional gastrointestinal disorders in patients with eating disorders. Scand J Gastroenterol. 2005;40(8):929-935. 3. Abraham S, Luscombe GM, Kellow JE. Pelvic floor dysfunction predicts abdominal bloating and distention in eating disordered patients. Scan J Gastroenterol. 2012;47(6):625-631. 4. Loberea I, Santed MA, Bolaños Rios P. Impact of functional dyspepsia on quality of life in eating disorder patients: the role of thought-shape fusion. Nutr Hosp. 2011;26(6):1363-1371. 5. Abraham S, Kellow J. Exploring eating disorder quality of life and functional gastrointestinal disorders among eating disorder patients. J Psychosom Res. 2011;70(4):372-377. 6. Janssen P. Can eating disorders cause functional gastrointestinal disorders? Neurogastroenterol Motil. 2010;22(12):1267-1269. 7. Friesen N, Hansen RD, Abraham SF, Kellow JE. Fructose-sorbitol ingestion provokes gastrointestinal symptoms in patients with eating disorders. World J Gastro. 2009;42(15):5295-5299. • Anxiety and GI symptoms predated the eating disorder although there was no strong family history of GI disturbances. • The patient experienced significant symptom relief while in residential treatment for her eating disorder. • The patient reports drinking 64 oz of diet soda daily and chewing gum excessively to minimize hunger. • She is following approximately 50% of her meal plan and typically eats every six to seven hours. • The patient reports consuming four to five servings of dairy per day with very little alternative protein sources. The RD asked the patient to make an appointment with her primary care physician to be tested for lactose intolerance and celiac disease as precautionary measures. Her tests came back negative. The dietitian provided the patient with education regarding the challenges her eating disorder behaviors were creating for her GI system. Due to her GI distress, the patient was willing to increase her meal plan compliance by eating every three to four hours and significantly decreasing her consumption of diet soda and artificial sweeteners. The RD also suggested she take digestive enzymes before meals and a daily probiotic. Moreover, the dietitian and a therapist worked with the patient and suggested she take a premeal antianxiety medication and perform deep breathing exercises to decrease her stress response to food. Within one month, she reported a near disappearance of all GI disturbances.